When Andrew Rannells left Nebraska for New York City in 1997, he, like many young hopefuls, saw the city as a chance to break free. To start over. To transform the fiercely ambitious but sexually confused teenager he saw in the mirror into the Broadway leading man of his dreams. In Too Much Is Not Enough, Rannells takes us on the journey of a twentysomething hungry to experience everything New York has to offer: new friends, wild nights, great art, standing ovations. At the heart of his hunger lies a powerful drive to reconcile the boy he was when he left Omaha with the man he desperately wants to be. As Rannells fumbles his way towards the Great White Way, he also shares the drama of failed auditions and behind-the-curtain romances, the heartbreak of losing his father at the height of his struggle, and the exhilaration of making his Broadway debut in Hairspray at the age of twenty-six. Along the way, he learns that you never really leave your past—or your family—behind; that the most painful, and perversely motivating, jobs are the ones you almost get; and that sometimes the most memorable nights with friends are marked not by the trendy club you danced at but by the recap over diner food afterward. 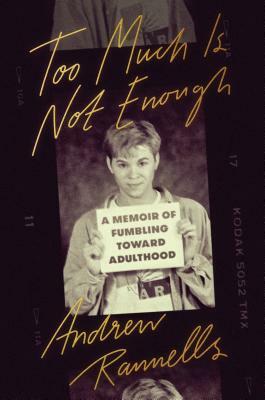 Honest and hilarious, Too Much Is Not Enough is an unforgettable look at love, loss, and the powerful forces that determine who we become. Andrew Rannells is an actor, singer, and performer best known for originating the role of Elder Price in The Book of Mormon and playing Elijah Krantz in HBO's Girls. A Tony and Drama Desk nominee and Grammy winner, he has also played Hedwig in Hedwig and the Angry Inch, King George III in Hamilton, and Whizzer in Falsettos, and most recently starred in the 2018 Broadway revival of The Boys in The Band. On the small screen, he has appeared in Girls, The New Normal, The Knick and the recent Amazon anthology series The Romanoffs. He will soon be seen in the upcoming series Black Monday for Showtime. Rannells's film credits include Why Him?, The Intern, Bachelorette, and A Simple Favor. His writing has been published in the New York Times "Modern Love" column. This is his first book. "Candid, funny, crisp...[this] memoir is honest and tender about lessons of the heart." "Witty, candid.... An honest, detailed account of one man pursuing his dreams." "Fueling his prose with pop-culture references, [Rannells] verbalizes feelings of insecurity with shocking poise as he describes being left adrift in a new city....This is certain to resonate with all those brave enough to leave their comfort zones in pursuit of their dreams, and it is clear Rannells still has more stories yet to tell." "Funny and charming...a must-read for both theater geeks and newbies alike." "[Rannells is] as personal as possible in each chapter, in the style of his friend and Girls creator Lena Dunham....[An] unguarded book."